I completed my BBA program with a major in Marketing. The BBA Internship Program is a required course for the students who are graduating from the Business Administration Department of Darul Ihsan University. It is a 6 credit hour course with duration of 12 weeks. Students who have completed all the required courses are eligible for the course. I am interested about banking sector. I was assigned to Standard Bank Limited (SBL), Principal Branch, Dhaka. In banking sector there are different customer perceptions about service quality. Based on the customer perceptions about service quality, customer chose different banks. That’s why I have done a research to collect information from the customers about their perception of service quality in Standard Bank Ltd. at Principal Branch. To know the customer perceptions about service quality of Standard Bank ltd.
To assess current customer of service quality of Standard Bank Ltd.
To highlight different activities of Standard Bank Ltd.
To analyze the service quality performance of the bank according to varies activities. To highlight the major problem of service quality by Standard Bank Ltd.
To study customer responses towards the service quality. The scope of this report is limited to the overall description of the company, its customers’ perception about service quality, and its position in the industry. The scope of the study is limited to organizational setup, functions, and performances. Service provides should have the skill and knowledge needed to perform the service properly (Churchill & Peter). The possession of the required skill and knowledge to perform the service (Kerin, Hartley & Rudelious). Customers want to service provider to listen to them. Keep them informed, and use language they can understand (Gilbert& Paul peter). The keeping customers informed in languages they are understand, and listening to them and its understanding the customer (Berkowitz, Kerin, Hartley & Rudelious). Service should be trust worthy, believable, and honest (Gilber & Paul peter). For trustworthiness, believability and honesty of the service provider (Berkowitz, Kerin, Hartley & Rudelious). Customers want to service provider to protect them from danger, risk or doubt the service provider should be customer that he or she will respect the confidentiality of personal information (Gilber & Paul peter). Its freedom from danger risk and doubt (Berkowitz, Kerin, Hartley & Rudelious). Service providers should try to understand what their customers want and need ((Gilber & Paul peter). Customers look for quality in the equipment, facilities & communication materials used to provide the service (Gilber & Paul peter). Secondary Data are Data that are collected from published materials. I have used internet and magazines to clarify different conceptual matters. I have used secondary sources such as annual report, prior research report and other published documents of SBL. The first step of sampling design is to define the population. Because of the time limit the study was restricted among the customers of Principal Branch of SBL. The respondents were selected from SBL. The criteria for selecting respondents, a probability sampling method “convenience sampling” were used. I was responsible for collecting primary data and conducted an interview with each respondent. Sample size: Because of resources and time constraints the preliminary nature of investigation was restricted to only 40 respondents. The questionnaire has two parts one part contains statement related to independent variables, and the other part related to general information. The independent variables include 34 items: three times belong the reliability, four times to Communication, three times belong to responsiveness, five times belong to Access, two times belong to Courtesy, four times belongs to Understanding, three times belong to Credibility, three times belong to Security, two times belong to Competence, and five times belong to Tangible. Respondents were asked to indicate to what extend to agree with each time. The respondents were categorized as strongly agree to strongly disagree on a five point Likert scale. Questionnaire was developed in English on basis of insight from interview with respondents. Some demographic questions were in the Questionnaire for a more in-depth interpretation of responses. In analysis data we used simple statistical method such as calculating the mean value, standard deviation, correlation of the data. The characteristics of the data are represented by these values. Unwillingness of the respondents the main limitations of this report. The research was conducted only within the customers of Principal Branch. The survey was limited to the customers of Personal banking division and does not cover the organizational or corporate customers of SBL to the time constraints. Relevant data and document collection were difficult due to the organization confidentiality. Workload at my job place was a barrier to prepare this report. Bank is the most important institution in a country. In Bangladesh this institution is gradually increasing. Standard Bank Limited (SBL) was incorporated as a Public Limited Company on May 11, 1999 under the Companies Act, 1994 and the Bank achieved satisfactory progress from its commercial operations on June 03, 1999. SBL has introduced several new products on credit and deposit schemes. It also goes for Corporate and Retail Banking etc. The Bank also participated in fund Syndication with other Banks. Through all these myriad activities SBL has created a positive impact in the Market. Standard Bank Limited was incorporated in Bangladesh as a public limited company with limited liability under the Companies Act, 1994 and commenced commercial on 3rd June 1999. The bank went for the public issue of share on in 2003 and its shares are listed with Dhaka stock exchange and Chittagong stock exchange. Now it has 39 branches all over Bangladesh. The commercial banking activities of the bank encompass a wide range of service including accepting deposit, making loans, discounting bills, conducting money transfer and foreign exchange transactions and performing other related services such as safe keeping, collection, issuing guaranties, acceptance and letter of credit. The mission of the bank is to be utmost trustworthy stakeholder, careful, committed for equitable and sustainable growth based on diversified deployment of fund/resources leading the bank to the peak of healthy and wholesome financial institution. The bank is marching forward with the vision of it would serve as partner and advisor of the clientele to trade, commerce and industry. From the year 1999 to year 2009 Standard Bank Limited established 39 numbers of branches in different districts of Bangladesh. The Principal Branch located in MetropolitanChamberBuilding (Ground Floor), 122-124, Motijheel C/A, Dhaka 1000, Bangladesh. Maintain all types of account. Intend other banking sector etc. SBL also collect TITAS bill, WASA bill, Telephone bill and Electricity bill. Deposit Product of Standard Bank Limited. Give Healthy Return to the Deposit. Standard Bank Ltd. is a 3rd generation private commercial bank in Bangladesh. Mercantile Bank Ltd., EXIM Bank Ltd., Bank Asia Ltd., One Bank Ltd., First Security Bank Ltd., Premier Bank Ltd., Mutual Trust Bank Ltd. got license in the year 1999. On the other hand National Bank Ltd., IFIC Bank Ltd., The City Bank Ltd., AB Bank Ltd., United Commercial Bank Ltd., Islami Bank B’desh Ltd. etc. are known as 1st generation private commercial bank and Dhaka Bank Ltd., Prime Bank Ltd., South East Bank Ltd., Dutch-Bangla Bank Ltd., Social Investment Bank Ltd., Al-Arafah Islami Bank Ltd. etc. are 2nd generation bank in terms of their launching year. Generally 3rd generation private commercial banks are the main competitors of SBL. But SBL is growing quickly, that’s why this bank is competing with all the private & public commercial bank now a day. There are more than 40 employees are working at the Principal Branch. SVP & Branch in charge Leading the branch & advance related work. VP & Second Man Supervising & customer relationship. Management team is the most important part of an organization. Management teams of the SBL are given blow………..
Unskilled and unprofessional persons are always the burden to an institution, which add only to make the organization heavy headed and losing one. Human Resource Division has been shouldering the responsibility to turn these burdensome persons into human resources and fundamental assets by making them professional, skilled and efficient resource personnel. To carry out this solemn responsibility a training institute has been established in the premises of head office with accommodation for training of 20 participants at a time. Meanwhile 80 officers have been trained on foundation course on general banking and cash. Seven day training was also conducted by the institute at Chittagong where 20 participants were trained on general banking and cash so far. Apart from that, the division has been arranging periodical off the job training programs conducted by BIBM and BBTA and other professional training institutes on different aspects and courses to enrich the store of banking knowledge and experience of all officers. At the same time the division has been organizing time to time in-house training programs, among which the following are note worthy. Communication rate between managers, assistant or the work team is moderately high. For achieving any kind of organization goal, most of the frequently communicate with each other. They are bound to maintain frequent relationship with each other. Daily working hour of the organization is 8 hours, from 10 am to 6pm, five days a week. But sometimes it needs to work on Saturday. They are very much conscious about the daily assignments and attendance. Remittance: To remit money to home and abroad through T.T, D.D, Pay- order, Travelers cheque, etc. Other services:- e.g. Locker service, to receive different types of bills of clients to issue Guarantees and counseling etc. During our research we observed that General Banking of this branch consists of different sections, namely Account Opening section, checkbook Issue, Remittance Section, Clearing and Bills Section, Accounts Section, Cash Section. Opening of Account is the contract that establishes the relationship between a banker and a customer. So this section pays a very important role in attracting customer and therefore should be handled with extra care. Banks will act fairly and reasonably in all their dealings with their customers, Banks will help customers understand how their accounts operate and seek to give them a good understanding of banking service, Banks should maintain confidence in the security and integrity of banking and payment system. Current Deposit Account is most suitable for private individuals, traders, merchants, importers and exporters, mill and factory owners, limited company’s etc. For opening of a Current Account minimum deposit of Tk.1000/= is required along with introductory reference. No interest is given on the Current Account deposited money. This deposit is primarily for small-scale savers. The Principal Branch objective of this account is to save small savers money. Hence there is restriction on withdrawals in a month. Heavy withdrawals are permitted only against prior notice. Minimum amount to Tk.500.00 is required as initial deposit. Formally withdrawal not allowed more than ¼ th of the balance. The rate of interest is 6% against S.B. Account. Fixed deposits are time deposits or time liabilities. These are the deposits in which an amount of cash is deposited in Bank for a fixed period specified in advance. In case of FDR Account, the bank does not have to maintain a cash reserve. So, Standard bank offers a high interest rate in these accounts. I had to help the officers in most of their work. I helped the customer to prepare & send the Demand Draft (DD), Telegraphic Transfer (TT) and Pay Orders (PO). The person intending to remit the money through a Demand Draft (DD) has to deposit the money to be remitted with the commission which the banker charges for its services. The amount of commission depends on the amount to be remitted. On issue of the DD, the remitter does not remain a party to the instrument: i) Drawer branch ii) Drawee branch iii) Payee. This is treated as the current liability of the bank as the banker on the presentation of the instrument should pay the money. Customer is supplied with DD form. Customer fill up the form, which includes the name of the drawer, name of the payee, amount of money to be sent, commission, name of the drawee branch, signature and address of the drawer. The customer may pay in cash or by cheques from his accounts (if any). After the money is paid and the form is sealed and signed accordingly it is given to the DD issuing desk. Upon block have two parts one for bank and another for customer. Bank part contains issuing date, drawer’s name, payee’s name and some of the money and name of the drawee branch. After finishing all the required information entry of the DD is given in the DD issuing register and at the same time bank issues a DD confirmation slip is entered into the DD advice issue register and a number is put on the confirmation slip form the same register. Later the bank mails this advice to the drawer branch. Telegraphic transfer (TT) is another widely used mode for remittances of funds. In case of telex transfer the message for transfer of funds is communicated through tested telex. SBL generally recovers from the telex charges in addition to the usual service charges. The customer deposits money with SBL to be sent. The customer obtains a cash memo containing TT serial number. TT serial number, notifying part name is mentioned in the telex message. The Telex Department confirms transmission of the telex. Customer fills the TT form and pays the amount along with commission in cash or by cheques. The pay order is an instrument issued by bank, instructing itself a certain amount of money mentioned in the instrument taking amount of money and commission when it is presented in bank. Only the branch of the bank that has issued it will make the payment of pay order. Deposit money by the customer along with application form. After filling the form carefully, the customer is pays the money in cash or by cheque. Writes down the name and address of the beneficiary on the main part of the PO block. In other two part name and address of the customer is written. The teller gives an entry to the registry book and maintains the same number of PO block. Two authorized officer signed the PO block. Give necessary entry in the bills payable (Pay Order) register where payee’s name, date, PO no, etc is mentioned. After scrutinizing and approval of the instrument by the authority, it is delivered to customer. Signature of customer is taken on the counterpart. We total surveys customers are 40, in between them 80% are male and 20% are female. 55% respondents age between 40-50 and 30% respondents age between 29-39. 72.5% respondents are service holder & 15% respondents are business man. 45% respondents income level is tk. 20,000-40,000 and 35% respondents income level tk. 10,000-20,000. 17.5% respondents come from Motijheel. Here mean values above 3.5 represents respondents are satisfied with this statement and satadard deviation below 1 represents better situation for the statement. Accuracy in billing is very essential for banking transaction here mean value is 4.88 and SD is .335. SBL keeps record correctly, here means value is 4.38 & SD is .540. SBL performs the services at the designed banking time here mean value is 4.45 & SD is .504. SBL provides mailing transaction slip quickly here mean value is 4.43 & SD is .747. SBL calls me back quickly, if I face any problems here mean value is 4.20 & SD is .791. If I face problems SBL sets appointment quickly, with the right person here mean value is 4.25 & SD is .742. Employees are highly knowledgeable and skilled in SBL here mean value is 4.43 & SD is .501. Overall knowledge and skill of operational support personnel in SBL is very high here mean value is 4.43 & SD is .636. Employees of the bank are very much friendly and polite here mean value is 4.33 & SD is .730. Public contact personnel of this bank are very clean and neat in appearance here mean value is 4.38 & SD .740. SBL clearly explains their services whenever I want to receive it here mean value is 4.40 & SD is .672. No outsider knows about the deals between me and banks here mean value is 4.55 & SD is .552 etc. Those statements scored less than 3.5 on mean value and standard deviation value is higher than 1, respondent dissatisfied with those statements. I do not have to wait for long to receive the service at the bank here mean value is 3.50 & SD is 1.062. Writing Pay-Order: It is issued by the bank in favour of cash money. This service is used by bank to reduce the bearing or lost risk of the bearer. Writing Pay-Slip: Bank provides this slip to pay the obligations to the service provides of the bank instead of cash money. Writing Demand Draft: Bank uses this draft to transfer the client’s money to different places through the banking channel. Using the STALER Bank Software: Inter Branch Transaction Advice is software that helps to doing inter branch banking transaction. Opening account in STALER Bank Software: By using this software I learnt how to open a bank account into the data base. Checking balance in STALER Bank Software: By using this software I can check the balance of our clients. Showing the statement in STALER Bank Software: I can show and provide hardcopy of the client’s account statement by using the STALER Bank software. Printing Online Voucher in the STALER Bank Software: I had to print both the received and sent online voucher using STALER Bank Software. Writing Debit Voucher: Bank uses this voucher to transfer the balance of sender’s account to another account. Writing Credit Voucher: Bank uses this voucher to receive the balance of receiver’s accounts from another account. Registering documents inward & outward dispatch: Banks uses this documentations or registration process of all inward and outward documents, papers, letters, checks etc. through dispatch department. Preparing (KYC) Know Your Customer: Bank uses this form to know the customer information for further uses that is filled up by customers at the beginning of the accounts opening. Issuing Cheque Books: Before issue the check book bank verify the accounts and provide the check to the clients for withdrawing money from bank. Sig. (2-tailed) .035 .325 .123 .039 .122 .082 .036 .969 .027 . Communication correlate with credibility is .724 & correlation is significant at the 0.01 level (2-tailed). Communication correlate with understanding is .831 & correlation is significant at the 0.01 level (2-tailed). Credibility correlate with tangibility is .709 & correlation is significant at the 0.01 level (2-tailed). Understanding correlate with credibility is .738 & correlation is significant at the 0.01 level (2-tailed). Security correlate with tangibility is .600 & correlation is significant at the 0.01 level (2-tailed). Accessibility correlate with communication is .635 & correlation is significant at the 0.01 level (2-tailed). Courtesy correlate with tangibility is .710 & correlation is significant at the 0.01 level (2-tailed). Responsiveness correlate with understanding is .744 & correlation is significant at the 0.01 level (2-tailed). 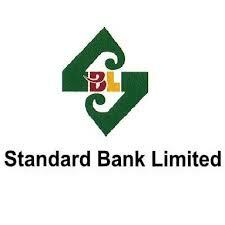 Standard Bank Limited is the private sector bank of Bangladesh fully owned by local entrepreneurs. Bank plays an important role in the business sector and in the industrialization of a country. Among all the 39 branches Principal Branch performing much better than the others. The performance of the branch for last six months is so impressive. As we mentioned at the very beginning of the report, the topic of this report is Study the Customers’ Perception about the Service Quality of Standard Bank Ltd. at Principal Branch. We used Paraguayan’s 34- items and likert scale that identify the perceive service quality along ten factors, namely Reliability, Communication, Responsiveness, Access, Courtesy, Understanding, Credibility, Security, Competence and Tangibility. Through Bank is performing well in term of their financial performance, bank has to concentrate on some problem of service of bank that makes the clients dissatisfied. After in-depth interview we would suggest to the bank should follow the following recommendations and guidelines to improve the perceive service quality of the bank. Necessary step taken by the bank to improve the ATM service because its mean value is 1.35. “All the machine it is using are in good condition” in this statement customers are agree with strongly (mean value 4.5). So management can use it for promotion. “The personnel of the bank are very formal in appearance” in this statement customers are agreeing with strongly (mean value 4.53). So management can use it. The credibility level will be increase 72% if the communication level will increase at 100%. So management must improve the communication level. The tangibility level will be increase 60% if the security level will increase at 100%. So management must improve the security service. The courtesy level will be increase 71% if the tangibility level will increase at 100%. So management must improve the tangibility.